Attendance at a TED conference is by application. If you'd like to come to TED, apply to attend. We read every application, and actively seek out leading thinkers and doers across a wide range of fields. Already registered for a conference? 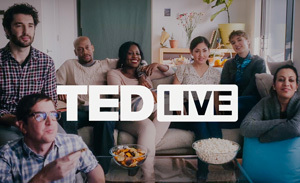 With TED Live, you can watch every conference session — including Q&A's and other exclusive content — on-demand from the comfort of your living room. Each TED and TEDGlobal conference features more than 50 of the world's most innovative and influential speakers. If you know someone who belongs on the TED stage, or if you belong there yourself, we want to hear from you! TED began as a small conference in Monterey, California. That single conference is now multiple annual or bi-annual events — TED, TEDSummit and TEDWomen — as well as occasional deep-dive conferences and events such as TEDGlobal, TEDYouth and TEDIndia.